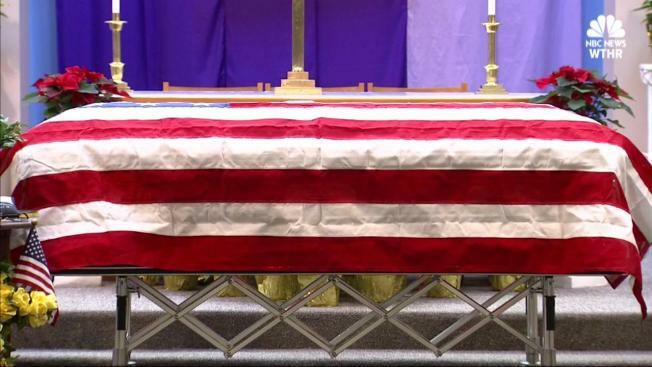 Although he died with no known family, the sanctuary at Indiana's Allisonville Christian Church was nearly full Saturday afternoon for one veteran's funeral service. "We didn't know him, but we showed up, because vets help vets," Veterans of Foreign Wars District 11 Commander Russell Pryor said. "I think this was wonderful today," Pryor said. "I mean, to see every place out here, looking around, being filled with people who just have a love in their heart because of a service that he did for us and for this country." Glenn Shelton was born in Louisville, Kentucky, earned a Purple Heart in the Vietnam War and died in Indiana at age 68. No family claimed his body. In fact, no one at the funeral knew Shelton. Except for Roy Ladd. "It was amazing — when I came here for Glenn, I was expecting to be the only person here that knew him," Ladd said. "And I am the only person who knew him, but I never expected this many people to be here." Ladd — who went by the nickname "Bennie" in those days — lost touch with his good friend more than 30 years ago, when Shelton left town. “Whenever you saw Bennie, you saw Glenn. Wherever you saw Glenn, you saw Bennie. We just ran together. We played basketball together. We played cards together. We just did everything together - [he was a] very funny, comical, easy-going, easy to get along with, very likeable person." He was happy to see that his once-close friend's life was being honored. "I was just totally shocked at all the people that showed up that did not know him," Ladd said.